Synopsis: When Vin is trapped, Chris must fight to save his friend's life. Website Link if Any: Neon RainBow Press Fan Fic site coming soon! The morning dawned bright and sunny, a welcome change from the days and days of on-again, off-again rain they had been having. Early summer in the desert was usually hot and dry, but this year had been an exception. A drizzling rain had plagued them and, on the rare days that started out bright and sunny, tremendous afternoon thunderstorms broke out like they normally would in August, soaking the already water-logged ground and bringing some flooding to the Territory. No one could remember seeing a summer like this one. Flowers that would have died weeks earlier still bloomed and washes that normally only ran after severe thunderstorms in the nearby mountains now looked like permanent creeks. The excess rain promoted grasses that turned the hillsides a fuzzy green, and rabbits and coyotes could be found in abundance. And, everyone agreed, the unusual weather had held the summer heat at bay much longer than usual. They all knew it couldn't last, but for the moment it was giving everyone something to talk about, and sparing them a few weeks of blistering misery. The odd weather had also put off the bandits, bank robbers, rustlers and other unsavory types who might have otherwise preyed upon the local townsfolk. And, as a result, the seven regulators who protected Four Corners found themselves with little or nothing to do  a situation none of them were very comfortable with. So it was with the greatest of pleasure that they had accepted an invitation, delivered by Rain, to join her and the other families at the Seminole village for a celebration on the day of the next full moon. Their resident tracker had been able to tell them exactly which day that would be, and the seven peacekeepers had made their preparations, expectations running high for a much-needed distraction. On the morning of the chosen day, the Seven met in the livery and saddled their horses, easy banter flowing between them as they worked. Then, they mounted their horses and headed out toward the Seminole village at a leisurely pace. "Anyone know why we're the guests of honor?" JD asked the group as they rode along. No one had an answer, but Vin suggested, "Probably jus' want t' thank us fer helpin' 'em out last year. Some tribes mark the anniversary of 'n important event like that by holdin' a celebration. It's a way fer 'em to thank their spirits fer lookin' out fer 'em." JD puffed up a little. It was also the anniversary of these men coming together to work as peacekeepers, he knew, and it was also almost a year since he had arrived in the west. Then his shoulders sagged a little and he shot Vin a sideways glance. "Uh, we ain't gonna have to give a speech or anything, are we?" Vin glanced over at the younger man and grinned. "Hell, JD, I don't know," he replied. "Might have t' say a few words. Why?" "What's the matter, JD? Don't ya like talkin' in front of a bunch of folks, all of 'em watchin' ya, hangin' on your every word?" Buck teased the younger man. JD looked from Vin to the ladies' man. "I didn't say that," he snapped defensively. Josiah and Nathan exchanged knowing, amused smiles. Wilmington grinned. "Hell, kid, all ya got t' do is just speak what's in your heart an' it'll be fine." "I ain't goin' out there to court those people, Buck." One time, he got to shaking so bad, he fell down, right there in front of the altar." The preacher paused and JD twisted around in his saddle, asking anxiously, "What'd he do?" "He started praying, but his throat was closed up so tight he sounded like a screeching harpy sent straight from the Pit itself. The people thought he'd been possessed by the Devil himself." JD's eyes rounded. "What happened?" Josiah blinked innocently. "They burned him at the stake." "What?" JD yelped. Then he scowled and shook his head. "Ah, preacher, you're pokin' fun at me  just like Buck." "Just that last part," Josiah assured the young man. "Father Andrew was a good friend of mine. He eventually got used to saying the Mass in front of an audience, but it was never easy for him. The important thing was that he tried." JD looked a little more mollified. "If you should ever desire some helpful suggestions," Ezra said solicitously, "I would be more than happy to share some of my wisdom with you." "No, thanks," JD told the gambler. "I don't want t' court these people, or swindle them." "Very well," Ezra replied, ignoring the comment, "but I assure you, the methods I could describe are time-tested and sure to"
"Hell, Ezra, what d' y' need 'methods' fer?" Vin asked him, interrupting the pitch the gambler was winding up. "Y' got 'nough charm t' talk the whiskers off a wolverine." "Why, thank you, Mr. Tanner. I can't tell you how gratifying it is to see that someone has seen my natural, God-given talents for what they are." The others snorted and shook their heads. "Yeah," Vin replied, "'nother weapon up yer sleeve." "Exactly, my good man, exactly," Ezra said with a smile and the others all chuckled. The ride continued peacefully, full of high-spirited discussions, all seven of the men enjoying the warm sunshine, the rain-greened landscape, and the company. When they finally arrived at the Seminole village, they were met by a welcoming keen from the women and enthusiastic war cries from the men and boys. The chief stepped out to greet them and Rain appeared, along with Opa Locka, who flashed Buck flirtatious glances through her long, dark lashes. The ladies' man was instantly all smiles, just like Nathan was when he saw Rain smiling shyly at him from over her friend's shoulder. "I think she likes me," Buck whispered to the healer as he nodded to the young woman. But Nathan's attention was on Rain, the young woman looking even more beautiful than she had the last time he'd seen her. The seven peacekeepers dismounted and some of the children ran forward to take their horses to one of the corrals. "Welcome, my friends, welcome," the chief greeted, smiling at them. "We are most honored that you have come to join us today." "We're honored y' asked us t' come," Vin replied for the others. The old man nodded his thanks to the tracker. The man called Vin Tanner had lived among the Indians, of that he was sure. And he had obviously learned many of their ways. He would make a good husband for one of his young maidens, if he could arrange it. "Come, come, my friends, it is nearly time for us to eat." 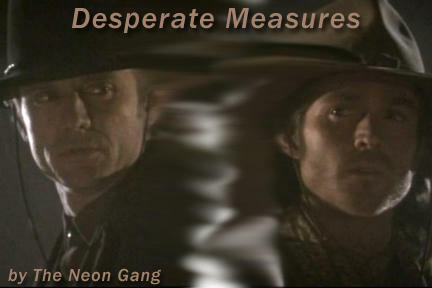 One of the children ran up to Ezra as the regulators trailed after the chief, asking him, "Will you show us more tricks? Please?" The gambler smiled down at the little girl, saying, "I would be delighted to perform some of my amazing feats of magic for such a beautiful young woman as yourself, my dear." The girl blushed and giggled, then hurried off to help her mother, who called to her from the doorway of one of the repaired houses. "I see you've acquired some admirers here," Josiah observed with a grin. Ezra flashed him a grin. "Another of my many natural gifts," he replied smoothly. "If y' ask me, it'd be better if it worked on ones a little older," Buck teased the gambler, his head turning as he passed Opa Locka. He smiled, tipping his hat, and tripped, stumbling forward several steps. The young women giggled at him. "And I see your 'animal magnetism' is in full flower today, Mr. Wilmington," the gambler returned. "I'll be sure to sit up-wind." "An excellent idea, brother," Josiah agreed. "Better watch yo'rself," Nathan cautioned the ladies' man. "I hear that one's lookin' hard fo' a husband." Buck's head whipped around and his eyes flew wide. "A husband?" Wilmington paled slightly. "You're a good friend, Nathan. A damned good friend." The healer fought back a grin as he nodded. "Just watch yo'self." A husband?" He shuddered dramatically, drawing laughs from Nathan, Josiah and Ezra. As they followed the silver-haired man, Chris glanced around the village. The destruction that had been visited on the community had all but disappeared. The houses, corrals, and lean-tos had all been rebuilt and most of the small pens holding chickens and pigs had been repaired as well. The abundant rain had helped their small gardens, which had grown tall and lush with healthy-looking vegetables. And wild flowers grew in clumps, adding color to the community. hospitality," the gunslinger observed with a faint grin. "Or our hostility," the old man agreed with a smile. "The Spirits of this new land have been kind to us this year." The chief led the seven men to a small clearing, ringed by tall cottonwood trees that cast dappled shade over the entire area. Colorful woven blankets had been spread out on the ground, and bowls and baskets full of food waited in the center. "Please, my friends, come and eat with us. Today we celebrate our victory over the Confederate ghosts," the chief said. "Our first victory in this new land." Chris could see the pain hidden in the old man's eyes and knew this was also a celebration for his son, Emala. The gunslinger clearly remembered the young man, and how he had died, fighting side-by-side with white men he could count among his friends. The seven men spread out and sat down on the blankets, accepting the food and drink that was passed to them by the men, women and children. It was a bounty, freely shared, and each of the peacekeepers was honored by the friendship it represented. Many of the young women took seats near Buck, the children near Ezra or Vin. Chris's gaze swept over his men and he felt himself really relax, something he rarely allowed himself to do. He was among friends here, family. And knowing he wasn't alone any more lifted some of the burden he had carried since his wife's and son's deaths, dissipating his usual depression like morning fog in the sunlight. His gaze settled on the tracker, who was seated across the blanket from him. Vin immediately looked up, meeting his eyes, his expression silently asking the gunslinger if anything was wrong. Chris's head barely moved, but it was enough to reassure the tracker that all was well. Vin looked back down at the small boy who was talking to him. For a brief moment Larabee wondered what it might have been like, seeing Vin with Adam, but the memory of the boy's smiling face was too painful and he pushed it away, determined to enjoy the day and not dwell on his past  something he did too much. From the corner of his eye, Tanner saw the flash of pain cross Larabee's face and knew the man was thinking about his lost child. But the grief passed quickly and Vin sighed softly to himself, glad, but wishing he knew a way to ease the man's sadness. He never suspected that he did just that with his steadfast friendship. The tracker knew Larabee was still watching him, but he turned his attention back to the boy, hoping the celebration wouldn't be too painful a reminder of what Chris no longer had to celebrate himself. The child smiled up at Vin, asking about his blue eyes, and where they had come from. And Tanner had an answer, one his Kiowa family had taught him. About halfway through the meal the first rumbles of thunder were heard on the far side of the foothills the village was built along. Vin and several of the older men all looked up into the sky, studying the clouds and birds they found there. "Better move this under that ledge," Vin said, nodding at a rocky shelf that jutted out from the hillside. Two of the old men nodded their agreement and the women stood and began shifting the food and blankets over to the protected area. Before the others had rejoined them, lightning flashed above them, and the rain began to fall, lightly at first, then with more determination. Most of the villagers took cover under the ledge, a few hurrying off to their homes instead. The peacekeepers remained with the majority of the people under the overhang, waiting out the storm. "Again?" JD lamented, staring out at the falling rain. "I hate this! I've never seen so much rain!" "Wet summer," Vin said matter-of-factly. "Happens sometimes; makes it so the springs still run in the dry years." JD thought about that for a moment and then nodded. "Guess it's a good thing then." if y' c'n find it." More lightning crawled across the darkening sky, followed by loud cracks of thunder, some so loud a few of the children squeaked with fright. "I felt the ground move!" JD yelped, looking down at the wet earth under his feet. "Just the thunder," Buck told him with an amused grin. "I'm tellin' ya, Buck, I felt the ground move!" JD argued with the man. Chris glanced over at Vin, who nodded his agreement with the young sheriff. He had felt it too. Then the skies seemed to open up and the rain poured down so hard they couldn't see the houses built just beyond the cottonwoods, or even the trees themselves. Several minutes later the pounding rain came to an abrupt stop. And, a few minutes after that, the clouds began to break apart and drift away, carried on a swift wind high up in the sky. The peacekeepers helped the villagers gather up what was left of their feast and carry it back to their homes. The men and women then gathered in the center of the village, beginning to sing and dance. The seven regulators stood and watched, Buck flashing smiles at all the young women who happen to glance his way. "Like looking at ripe fruit on the vine," he sighed longingly. "And it's just waitin' t' be plucked and savored." "Just be sure y' don't pluck one that's already got herself married," Nathan warned him. Buck's reply was interrupted by two small boys who came running into the center of the celebration, chattering excitedly in Seminole. The old chief frowned as he listened to them, and the dancing came to an abrupt halt. "What is it?" Chris asked the old man, worried by the chief's sudden concern. "One of the children is trapped in the old gold mine," he replied. "We must hurry." Chris and the others followed the old, silver-haired chief and several other men as they took a narrow path that led up the side of the foothills. The ground was wet and slick in spots, but they kept moving swiftly. "I only wish I had known about this fortuitous shortcut before," Ezra muttered under his breath. "So you didn't have to ride out on us?" JD asked him. The gambler shot the young sheriff a pained look. "Sorry, Ezra," JD immediately apologized. "I know it was different then; you didn't really know us. Besides," he added, "you came back to help." "I was another man then," Standish said softly. "Another man." JD shot him a half-curious, half-concerned look, but said no more. It didn't look like the gambler wanted to talk about it. When they reached the mouth of the mine shaft, the chief called out loudly in his own language. A small, frightened voice answered him in the same tongue, but it sounded weak and frightened to everyone's ears. "He all right?" Nathan asked the chief, his brow pinched with worry. "Tosi says he is trapped," the chief told the healer. Then he spoke loudly into the mouth of the shaft again, but this time there was no reply. Chris started into the mine, Vin on his heels. "Gentlemen, you may wish to reconsider," Ezra said softly, stepping out to stop them. His gaze darted to the old chief, not wanting to offend him, but needing to warn his friends. "Someone has to go get that boy," Chris snapped, meeting the gambler's eyes. "I agree, Mr. Larabee, completely, I assure you. But, if you will notice," Ezra said, waving down at the foot-wide rivulet of water running from the mouth of the shaft. "The ground water is rising as a result of the storms we've been having. Parts of that old mine are probably under water right now. If one of those walls should weaken and collapse, or give way partially, the water"
"I'll go," Vin cut in. "I c'n track the boy and git 'im out quick. He can't be too far in if we c'n hear him from here." "You're not going alone," Chris told the tracker, his tone making it clear there was no use arguing with him, he wasn't going to change his mind. "Better if I do it alone," Vin replied. "Ezra's right, it's goin' t' be unstable in there." "Let's go," Chris broke in. "We're wasting daylight." Then he stopped and looked at the others saying, "Wait here, just in case there's trouble." "Watch your backs," Buck told them, looking worried and unsure if he should listen to Larabee and stay, or follow after the man. Chris nodded, flashing his oldest friend a small smile. "We'll be right back," he assured the ladies' man. The tracker nodded to Wilmington as well, and then, together, he and Chris ducked into the mine shaft, making their way past a tangle of rubble just inside the opening. "Buck," Chris called back outside. "Yeah?" he asked, starting in to join them. "No!" Chris snapped. "Just get me a branch or something we can use to burn for light." The ladies' man nodded and ducked back out. A few moments later Buck stepped in just far enough to hand Larabee a thick tree branch that had been wrapped with cloth and was already burning. He handed it to Chris, saying, "It's wet, but it should work long enough for you to find something better. Be careful, both of you," he added as more rocks and dirt fell on them from the ceiling of the shaft. "Get back out there," Chris told the man. Then, taking the burning branch, he headed farther into the shaft, calling for the boy. Several yards in, he found an old torch that had been left along the wall of the tunnel and picked it up, setting it alight. With the additional illumination, Vin spotted another recent collapse of beams and rocky fragments from the ceiling of the shaft. And at the edge of that pile he spotted Tosi, lying half-buried under the rubble. "There!" he said, pointing. He and Chris hurried over to the boy, Larabee leaning the torch against the wall of the passage, then checking to see if the child was alive while Vin started digging to free him. Tosi moaned softly as Vin worked and Chris knelt and lifted the boy so his shoulders rested on his thighs, keeping him out of the water that was starting to pool on the ground around them. The boy's eyes blinked open and he gasped, frightened at first. "Easy, son," Chris said, his voice soft and soothing. "We'll have you out of here in no time." Tosi looked from Chris to Vin, recognition settling into his expression. "Did Ezra come?" he asked them airily. "Yep," Vin replied. "He's waitin' fer y' outside. Been showin' yer friends more of them fancy card tricks 'a his." He looked up, meeting Chris's worried gaze. "See if y' c'n pull 'im out now." Larabee gently lifted and pulled, the child sliding free of the pile with a little effort. Chris stood, cradling the boy in his arms, and immediately started back for the entrance of the cave. Vin grabbed the torch and hurried past the gunslinger to light their path out. "Chris?" they heard Buck calling. "Chris?" "We have him!" the gunslinger called back. "We're on the way out!" Three steps farther another tremor hit, more violent than the first. A low, growling rumble gave them a warning a moment before the ground began to shake, but there was no time to do anything. "Run!" Vin snapped at the gunslinger. Chris started to comply, but the sharp crack of wood splitting filled the shaft like a gunshot the moment before ceiling fragments rained down on Larabee and the boy. Chris lost his footing and knew he was going to fall. He flung Tosi away, hoping to spare the child another pummeling. The boy squealed with fright, but Vin caught him and set him down on his feet. "Chris!" he called, turning to look at the gunslinger as more debris fell on him. Tanner pressed the torch into Tosi's hand, saying, "Head fer the entrance  now!" The boy nodded, his eyes wide and full of fear. But he didn't move. "Go! Hurry!" Vin told him, pointing. Tosi jumped at the sharp tone in the tracker's voice and hurried away as fast as his feet could carry him. The shaking stopped just as Vin reached Chris, who lay in the midst of the fallen debris, but Larabee was already struggling to his feet. Tanner grabbed the man's arm and helped him up. "Y' all right?" he demanded. Chris nodded as he coughed. "Let's get the hell out of here," he choked. They turned and started after the boy, but another shot-like crack exploded in the shaft and, a moment later, wood, rock and dirt collapsed, filling the tunnel in front of them and cutting off their escape. The two men dove for opposite sides of the passage, both hoping to avoid being hit by the materials falling from overhead, but rocks and pieces of rotted beams still struck them glancing blows. Chris was knocked off his feet a second time, a blinding flash of light the last thing he remembered seeing before a wave of blackness overtook him and carried him away. Vin! he called, but the word never reached his lips. "Chris!" Vin yelled when he saw Larabee go down for a second time. He lunged away from the wall of the shaft, but falling debris caught him along his left side, from face to hip, driving him to the ground. He hit the floor of the shaft and rolled over, starting to sit up at the same time so he could get to Larabee. Then, another large portion of the ceiling broke free and fell, landing on his legs and abdomen. Tanner cried out as something bit painfully into his leg, and then his breath was stripped away by the weight of the beam that fell across his hips and stomach. He fought for a breath, but the weight pressing against him made it impossible for him to fill his lungs. He struggled frantically, but the heavy piece of wood didn't budge. Panic flared, but a glancing blow to his head carried him unwillingly into the darkness. The men gathered at the mouth of the cave staggered backward when the tremor hit and, a few moments later, a cloud of dust belched out of the open mouth of the shaft. "Chris!" Buck cried, fear squeezing his heart with icy fingers. Tosi darted out of the entrance, dropping the torch when he saw the men standing there. Nathan immediately scooped the boy up and began to check him over for injuries. "Where are Chris and Vin?" he asked the child. "Inside," he said, and then began to cough. As soon as the air cleared enough to allow them to see the entrance of the mine, the other peacekeepers rushed forward into the opening. "Chris!" Buck bellowed. "Chris, can y' hear me? Vin!" JD immediately began digging into the jumbled pile of rocks, dirt, and broken wooden beams, but as soon as he created a hole, more debris rushed to fill in the space. "Stop," Ezra said, reaching out to grab hold of JD's shoulder, but the young sheriff shrugged him off, continuing to dig. "Stop!" the gambler snapped, louder this time. JD jerked up, surprised by the man's tone, and the command. "We've gotta do something, Ezra!" he snapped back at the man. "They could be buried in there!" "There is far too much debris here for us to move it," Ezra said, his gaze sweeping over the portion of the shaft he could see. "We'll never be able to tunnel through all of this in time. And we would require support beams as we progressed if we did." He looked upward, his brow furrowing in thought. "But perhaps we can reach them in time from above." "There's got to be a whole lot more earth to move above us than in front of us," JD argued with him. "The mine's built into the hillside," Josiah said, nodding as he caught on to what the gambler was suggesting. "The shaft might be close to the surface at the top." Ezra turned to the chief saying, "Send someone back to the village. Bring back more help. You and the rest of your people stay here. My friends and I will go up onto the hilltop and call for you. With luck, you'll hear us. If so, call back, or send someone to tell us you've heard us." The silver-haired man nodded, then turned and gave his instructions. Nathan joined them, still holding the boy. "He's goin' t' be fine," he said. "Chris and Vin?" "They're still in there," Buck stated, frowning at the pile of rubble. "Not for long, Mr. Wilmington," Ezra said, stalking back out, the other peacekeepers following him. Water flowed into the tunnel, spreading out and creeping closer to the fallen gunslinger, reaching his hand first and then running down along the front and back of his arm. When it reached his chin, Chris moaned softly as consciousness returned in a painful rush. He coughed and spat, trying to clear the dust from his lungs and the water from his mouth. Then, with an effort, he pushed himself up onto his hands and knees so he was out of the rapidly rising water. His surroundings seemed to dip and warp with abandon as soon as he moved and he closed his eyes for a moment, willing the violent motion to stop. When he opened them again, the world had stopped its bizarre contortions, but his head throbbed excruciatingly. He started to stand, but had to stop when the motion forced him to retch. "Vin?" he called as loudly as he could, but the name came out as a weak, gritty scratch. There was no reply and he forced himself to his feet, looking around as best he could in the semi-darkness. Dust still hung in the air and Chris staggered through the water a few steps. "Vin?" he called again. And then he saw the tracker, lying in the water, floating actually, a pile of debris burying his lower body. "Tanner!" Chris called sharply, hurrying over to the man. He knelt down, and lifted Tanner's shoulders out of the cold water. The quick action caused his head to pound, creating sparks of lights that danced in front of his eyes, but he forced back the pain and asked, "Vin?" Blue eyes opened slowly. "Damn, Cowboy, what did y' hit me with?" Chris snorted softly. "Just a whole damned mine shaft," he replied, trying to see how bad it was. "Can you move your legs? Are you trapped?" Vin looked down at his buried legs and tried to move. He sucked in a sharp gasp and immediately froze. "Can't move." "Damn," Chris breathed. "Can you sit up? I'll see if I can't dig you out." Vin nodded and, with Chris's help, he was able to sit up by holding on to the beam. The water was just high enough to cover his lap. He looked down and realized that the beam had shifted somehow, and was now on his hips and upper thighs, but his ribs ached with a fiery agony that told him they were cracked or broken. He watched as Larabee began digging through the pile with his hands. The gunslinger's eyes were pinched at the corners, as was his mouth. "You hurt?" he asked Chris. "Head hurts," he replied, adding, "It's nothing." Vin didn't look like he believed it, but  thankfully  the tracker didn't say or ask anything more. It only took a few minutes for Chris to move most of the rubble off the tracker. One of the overhead support beams had fallen, pinning Tanner's legs. And it was big enough that he knew he wasn't going to be able to lift it off the tracker without some help. Looking over and meeting Vin's eyes, he said, "You should've gotten out when you could." Tanner shrugged. "Ain't the first time I overstayed m' welcome." Larabee chuckled softly, wiping the sweat from his upper lip with his shirtsleeve. "Want to try again?" Vin nodded and leaned back, bracing his hands against the ground  the water now up to his elbows. He waited and, when Chris tried to lift the beam, he struggled to drag himself out from under the weight. He managed an inch, at most, before he was stopped by another flash of pain shooting up his left leg and making him shout, "Sonuvabitch!" "Vin?" Chris questioned, then swallowed several times as he willed his stomach to settle. "Must have somethin' pokin' m' leg," he said, his words strangled by the searing pain shooting up his thigh. "Don't move," Chris said. "Let me take a look." Larabee dug some more, finally finding the real problem. A sharp fragment of stone was embedded in the man's flesh just above the knee. Blood oozed into the water from the wound in dark, twisting rivulets. He would have to remove the stone if Vin was going to pull himself out from under the beam. He looked up at the tracker. "You've got a stone that's cut into your leg. If I take that out, you think you can pull yourself free if I lift that beam a little?" The tracker shook his head. "Can't move more 'n a little, less y' c'n lift that more 'n the last time." "Damn," Chris breathed, knowing he couldn't do any better than he had the first time. Still, the stone had to come out so he could bind the bleeding wound. He moved over and knelt beside Vin, untying Tanner's bandanna, then crawled through the water to the tracker's leg. He put the cloth in his teeth and looked to Vin. "Ready?" he asked through the material. Chris reached into the water, got a grip on the stone and pulled. Vin cried out, his body jerking in response. The flares of light erupted in front of Larabee's eyes again, but he pulled the cloth from his teeth, sucked in several deep breaths, and tied the bandanna around Tanner's leg, knotting it down as tightly as he could under the cold water. The tracker gasped and groaned, but remained still. "Sorry," Chris said, feeling his stomach starting to rebel again. He leaned over and quietly heaved into the water. Wiping his face with his sleeve, he straightened and looked around again. "I'm going to go see if I can find something I can use as a lever for this damned beam." Vin nodded, still panting as his leg burned and throbbed. He glanced down to find the water a few inches deeper already. "Better hurry, Cowboy," he said. "This water's risin' damn fast." Larabee nodded and made a search of the section of shaft they had access to, moving as quickly as he could, but he found nothing long enough, or sturdy enough, to use against the heavy weight of the beam. He sloshed back to the tracker, noticing that Vin was beginning to shiver. "Nothing," he said. Tanner groaned, his eyes closing, his head tilting back. "Vin?" Chris asked, immediately dropping down next to the man. Chris blew out a breath, knowing he had to think of something, but he was at a loss and his head was hurting so badly it was hard to think at all. Then it hit him. He dropped down on his hands and knees and started frantically scooping dirt out from alongside Vin's legs, but a couple of inches down he hit hard caliche. "Damn it," he hissed miserably. Vin met Larabee's eyes and offered him a half-grin. "Hell, least it means that beam ain't sinkin' no farther." Larabee snorted. "Yeah, at least there's that." "Y' sure yer all right, Cowboy?" The tracker's eyes were full of worry and Larabee knew he couldn't lie to the man. "Head feels like I was kicked by a mule," he admitted. "Here, let me take a look," Tanner said, turning slightly so he could examine the gunslinger. The movement made his ribs hurt, but he needed to be sure Chris was all right. A moment later he said, "Got a good-sized lump here." "I'm not the one we need to worry about right now," Chris said, pushing to his feet. "I'm going to look again for a lever." Chris moved through the rising water, still trying to find a way out, but there was none. With a softly muttered curse, he turned and headed back to Vin. The cold water was already up to the shivering tracker's chest, and Tanner's face had turned a pasty grey that had Larabee more than a little scared. "How're you doing?" he asked Tanner when he reached him. "B-been b-better," Vin replied, his teeth chattering noisily. "Other end of the shaft's blocked just like this," Chris told him with a sigh. "Prob'ly why we ain't already drowned," Vin said. Chris's eyes rounded. "That's probably true, but that water's getting in somehow. If I can find out where"
Larabee was interrupted by a shaft of sunlight shooting into the semi-darkness and striking the water with a startling radiance. Both men immediately looked up, half-expecting to see the gates of Heaven, or maybe Hell, opening for them. But in the roof of the tunnel they found a narrow crack that reached to the surface. Chris sloshed over to stand directly beneath it. He squinted, the bright shaft of sunlight making his head throb. The fissure looked wide enough for a man to climb through, if he could get up there. The gunslinger knew the water would eventually carry him to the opening, but Vin was another matter. "Y' f-find a w-way out?" the tracker asked him. "Looks like," Larabee admitted, glancing over at Vin in time to see the relief flood the tracker's features. The feelings behind that expression felt like a fist in the gunslinger's guts. Vin was actually comforted, knowing Chris would survive this, even if he didn't. "But it's not going to help if we can't get that beam off you." "Least I know it'll be you collectin' that bounty on m' head." Larabee's green eyes flashed. "I'm not collecting anything, Tanner." Vin met the man's eyes and held his gaze as he said, "Y' ain't goin' t' move this beam, Cowboy. And there ain't no way t' stop this water from risin', neither." I'd rather die by a bullet." Chris frowned, fear suddenly flaring in his chest and making it hard for him to breathe. "What're you saying, Vin?" It comes down t' it, I want y' t' shoot me 'fore I c'n drown." "Vin" Chris started, fully intending to tell the man he couldn't  no, wouldn't  do it, but the raw terror in the tracker's blue eyes stopped him. Could he stand by and watch Tanner drown? "It's not going to come to that," he said, stalling for time. "Don't see how it can't," was the practical reply. "I want yer word, Larabee." Damn it! Chris hesitated, still not sure he could actually do it, but he knew he had no choice but to promise Vin he would. He took a deep breath, his stomach knotting as he forced his jaws to open so he could say, "You have my word." Ezra led the way to the hilltop and stood, glancing this way and that, trying to decide where the mine shaft should be located below them. Once he had picked a likely spot, he stalked over and yelled loudly, "Hello! Can you hear me? Hello?" "Ezra?" came a faint voice. "Ezra, that you?" "Mr. Larabee?" he called, the others immediately converging on him. "Ezra, there's a crack! Find it! Hurry!" The five peacekeepers began to search without delay, Ezra and Josiah on their feet, the other three on their hands and knees. "Here! Chris!" Buck exclaimed, locating the fissure. He lay flat on the ground and yelled through it, "Chris, can you hear me?" "I hear you fine," Larabee replied, staggering slightly  tipping his head back to stare up at the crack made his headache return with a vengeance. He couldn't make out Buck's features, but he could see the dark outline of the man's head. "Here!" Wilmington called over his shoulder. He looked back down through the crack and hollered, "Chris?" "Buck, I need a rope! Tie it to a horse. There's a beam on Vin's legs that's got to be lifted off. The water's rising. Hurry!" The tone of Larabee's voice told the ladies' man just how scared Chris was, and that chilled Buck to the core. He looked up at the others, saying, "JD! Go back to the village. Get the horses and all the rope you can find. Go! Now!" The young man turned without a single question and left at a full run. Then Wilmington told the others, "Vin's trapped under a beam." "The water?" Ezra asked, able to guess the real danger from the stricken expression on the ladies' man's face. Buck nodded, looking away from the gambler's worried expression. He turned back to the crack, calling down, "JD's on his way!" Nathan joined Buck at the edge of the opening. "You hurt?" he yelled down. "Vin's trapped," was Larabee's reply. "He's got a cut in his leg." "Chris, are you hurt?" the healer persisted. There was a moment of silence, then, "Got hit on the head," he called back up, refusing to look at Vin as he did. "Hurts some." Nathan met Buck's eyes and held them. "He's holding back," the ladies' man said. "I can tell by the sound of his voice." The healer nodded. It looked like they had two injured men in that shaft, and not much time to get them out from the sounds of it. "They goin' to fit through this?" Nathan questioned, trying to gauge the width of the opening. "I think so," Buck said, leaning into the crack. "Looks wide enough." From his position, Wilmington was able to see Chris as he stood below him, one hand raised to shade his eyes. The familiar black hat was missing and there was a dark streak in the man's blond hair that Buck guessed was blood. "Damn," he sighed softly. Then, glancing around, he caught sight of Vin in the gloomy shaft. The tracker looked like he was shaking, and Buck realized the man was shivering. The rising water must be cold. "Hurry, JD," he said softly. JD raced down off the hilltop as fast as he dared. He stumbled to a stop at the bottom, panting for breath, and then hurried on to the mouth of the mine. The chief and two other men stood there, waiting. "We did not hear you calling," the old man said. As much rope as you have," JD panted. The chief nodded and turned to the other two men, speaking to them in his native tongue. "They will take you the fastest way. The others will be here shortly," the old man told JD. He gazed up into the sky and began to sing, calling on the gods of this new land to help the friends of his people. Chris watched Tanner carefully. The shivering had stopped and a calm serenity had settled over the tracker. The water had risen so it was now up to his neck, just beginning to lap at his chin. He watched Vin tilt his head back and close his eyes and for a moment it looked like the man was sleeping, or praying, but then Chris realized he was gauging how much longer he had before the water covered his face. "They'll be ready soon," he said softly. The blue eyes opened and Vin turned his head so he could look at Larabee. "Reckon it might not be soon enough. Water's risin' faster." Moving slowly so he didn't raise any ripples on the surface of the water that might choke the tracker, Larabee moved over to stand beneath the crack and called up, "I need that rope, Buck! Now!" "They're comin'!" was the immediate reply. "I can see JD now; just a little bit more!" "Tell him to hurry, goddamn it!" Chris snapped. "Easy, Cowboy," Vin called to him. "They're doin' ever'thing they c'n. Don't need y' snappin' at 'em like a hungry spring bear." The gunslinger glanced over, meeting and holding the tracker's gaze. Chris knew that the peace he saw reflected there was due, in large part, to Vin's confidence that, should it come to it, Larabee would pull the trigger. The only problem was, he still wasn't sure if he could do it, and he didn't plan on finding out. But Tanner was rapidly running out of time. The tracker's head was now tilted back again, and this time the water was covering his ears. "Here it comes!" Buck called down from above. A moment later a coil of rope dropped into the rising water with a splash. Vin coughed and spat water from his mouth when the waves it created broke over his face. Chris scooped the rope up and walked back to the beam. "Hold your nose and close your mouth," he instructed the tracker. "Git movin'," was Vin's only reply. Then, ignoring his still-throbbing head, Chris sucked in a deep breath and ducked under the water. As Larabee disappeared, Vin sucked in a deep breath of his own, used one hand to pinch his nostrils closed, and pressed his lips and eyes closed. Water lapped over his face as Chris sank under the surface. The blond opened his eyes underwater, but the liquid was too silty for him to see anything clearly, and he closed them again. Using his hands to guide him, he found the beam and then Tanner. He tied the rope around the wood, close to the tracker's legs, his numb fingers slow and clumsy. He silently cursed himself and ordered his fingers to complete their task faster, but it was still taking too long. He surfaced, gasping in a breath. "Buck! Pull!" he hollered. The rope was almost immediately drawn taut. It began to squeak as the beam was slowly shifted. Chris heard Tanner's muffled cry of pain and looked back at the tracker. Vin was struggling to free himself, the water lapping over his face as he did. An expulsion of air was followed by a frantic gasp between the waves that moved over him. "Pull!" Chris yelled, slogging over and trying to help lift the weight off Vin. A moment later there was a sharp crack and the beam settled again on the tracker. The rope had snapped. "Here!" was the reply, followed a moment later by another coil of rope and then a second. "Use both! We're goin' to try and pull from the other side!" Chris cursed as he hurried over to grab the new ropes as quickly as he could, pulling them over to the beam. He grabbed the ends and started to duck back under the water, but Vin stopped him, a hand clutching desperately at his arm. "Y' promised," Tanner said, almost strangling as the water began to cover his mouth. "Hold on, Vin," Chris begged, then he ducked under the water again. He worked as fast as he could, his own pain now pushed to the back of his mind as he fought to save his friend's life. He could feel the tracker fighting, trying to inch closer to the surface of the water so he could take another breath. Larabee broke the surface, yelling, "Now! Pull! Hurry!" The ropes went taut again, and the gunslinger looked back only to find Vin's face now completely covered by the cold water. The tracker's blue eyes were open, staring at him, pleading with him. "Hang on!" Chris yelled at Tanner, grabbing the beam and pushing with every bit of strength he had left, but his eyes never left Vin's. The trust was still there, but there was fear as well. Then Tanner began to writhe under the surface, fighting with everything he had for his life. Larabee felt the beam begin to shift, but it was moving so slowly. Too slowly, he knew. Vin's arms flailed against the surface of the water, his fists pounding it, and he howled wordlessly at the gunslinger, blue eyes rounding wide with terror. Chris could still see those eyes, open under the surface, demanding that he keep his promise. He nodded and released the beam, his efforts not actually helping in the slightest anyway. Vin's struggles ceased and he met Chris's gaze one last time. Then he closed his eyes to spare Larabee, and waited. Fear like nothing he had ever known consumed Vin. He knew he was going to drown if Chris didn't keep his word. He fought, pounding the surface of the water, trying to make Larabee understand that it was time. Now. Then he caught the man's eyes and knew  Chris was hesitating, unable to keep his promise. "Now, damn ya!" he screamed as loudly as he could, sacrificing what little air he had left and hoping that, somehow, Larabee would hear him. He saw Chris step away from the beam, saw the gun in his had. He looked through the water, meeting the anguished green eyes and holding the man's gaze for a moment, trying to thank him as best he could. Then, he closed his eyes, not wanting his friend to see the life leave them. He felt himself start to breathe in the cold liquid and prayed Chris's bullet would be in time. And he felt the beam shift. Vin pushed hard, breaking the surface and gasping for breath, then coughing as he choked on the water already in his mouth. In the same frenzied moment he heard the shot and jerked, expecting to be hit. He forced his eyes open just as he retched, but even as his stomach and lungs tried to reject the water filling them, he smiled thinly. Larabee had kept his promise. A man couldn't ask for a better friend than that. It was a rare gift indeed and he hoped he would have been strong enough to do the same for Chris if the situation had been reversed, but he wasn't sure.